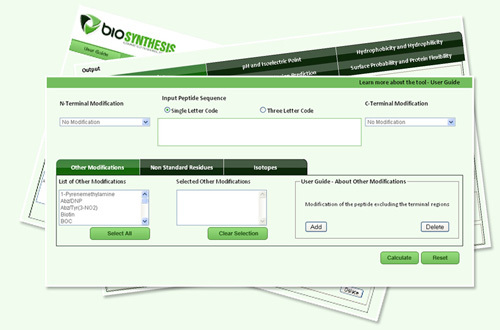 Welcome to the peptide property calculator tool presented by Biosynthesis. The tool is a one stop solution for calculation and prediction of various properties of protein. The tool compromises of 35 features from simple calculation of chemical formula to prediction of secondary structure in the protein. Synthesis Scale ≠ final yield. Indicated yields are valid for unmodified Oligos of > 20 nt. Indicate your minimum required yield in the "Item Notes" box.